Fantastic Mr. Fox moves at a leisurely pace, regularly stopping to enjoy the world that Anderson has borrowed from Dahl and explore its details. Explanations of the animal children's favorite game, "whack bat," and schematics of the local geography enhance the narrative rather than slowing it down, recalling similar moves that Wes Anderson has made in movies like The Royal Tenenbaums and The Life Aquatic with Steve Zissou. These elements hearken back to one of the themes of the director's earlier pictures, the lesson that the patriarch of each film tries to impart to his children: enjoy the specifics before you lose them. We often forget that children's entertainment is as obsessed with mortality as any high-brow literature or cinema. You're never too young to gather those rosebuds. 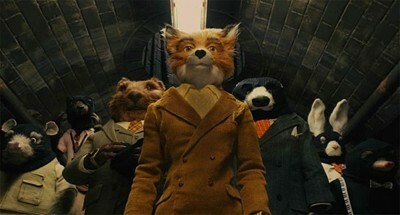 Which is not to imply that Fantastic Mr. Fox is heavy. It's anything but. This film is a fun romp through the animal kingdom. Eventually, the three farmers--voiced by Michael Gambon, Robin Hurlstone, and Hugo Guinness--have had enough of Mr. Fox's thieving and decide to do something about it. Their hunt for the creature goes overboard, driving all the animals underground, where they reconvene and rise up . The ensuing battle gives Mr. Fox a chance to redeem himself in the eyes of the others and Ash the opportunity to prove his worth to his father (and himself) and reconcile with his cousin. Along the way, there are musical interludes, references to other movies (Willem Dafoe voices a rat straight out of West Side Story), and many big laughs. 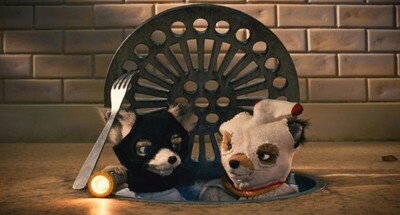 It's interesting that two of our most unique modern filmmakers--first Spike Jonze with Where the Wild Things Are and now Wes Anderson with Fantastic Mr. Fox--have chosen to withdraw from adult features and focus on adaptations of all-ages material for their latest efforts. Both have yielded amazing motion pictures with emotional resonance, and each with remarkably similar messages despite having different timbres. Just as Litte Max had to indulge in some wild rumpusing to understand himself in Jonze's film, so too does Mr. Fox encourage the other animals to be who they are, to let themselves go wild when the time calls for it. It's good to be responsible, but not at the sacrifice of one's sense of self. Bill Murray can provide the voice of a badger and they can put that badger in a three-piece suit, but underneath, he's still a mean ol' badger and even deeper down, still Bill Murray. Buy tickets to "Fantastic Mr. Fox" now!